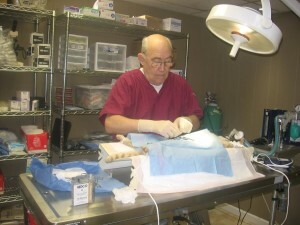 Preparing for surgery at a spay/neuter clinic. Helping Hands for Animals is a no-kill organization established in 1993 to address the pet overpopulation problem by implementing a reduced rate spay/neuter program and to promote education and awareness of prominent animal issues. We educate the public and provide help with managing feral cat colonies through TNR (Trap, Neuter and Return). We promote and enforce the humane care of dogs in Lancaster County’s puppy mills, along with any other abused or neglected animals who are reported to our volunteer Humane Society Police Officer. We depend on the public’s concern and contributions to help us achieve our goals of spaying/neutering, inoculating and providing medical treatment for all cats in our care. We are not affiliated with any other animal organization and do not receive subsidies from local, state or federal government agencies. Your entire contribution always goes directly to helping needy animals.